still doesn’t eat anything and goes on spiritual time travels. Among anthroposophists, she has ignited a controversy that could split the movement. Defiantly, with its massive concrete façade, the Goetheanum looms over Dornach and Arlesheim. At the foot of the hill, just half a kilometer down from the very center of anthroposophy, she has pitched her tent in a one-time carpenter’s workshop: Judith von Halle, by far the most controversial figure in the movement founded by Rudolf Steiner. Since Holy Week 2004, the 40 year old architect, originally from Berlin, claims to bear the wounds of Christ, the so-called stigmata, and not to have eaten a morsel of food. Even water she consumes in limited quantities. And all this without any significant weight loss or physical health problems. “The transformed physical body treats earthly food like poison,” explains von Halle. By her own account, she even had to stop using toothpaste because the tiny amount of alcohol contained in it caused “violent symptoms of poisoning” in her organism. That's not all: This follower of Rudolf Steiner, by her own admission, experiences “visions” just like the master himself and she embarks on “spiritual time travels.” Thus does she claim to have witnessed the actual crucifixion and resurrection of Christ. A few years ago in Germany [July 2008], Der Spiegel Magazine reported on her “dubious hunger story.” By contrast, in Switzerland the in-fighting among anthroposophists has yet to go public. Von Halle seems to live in retirement and to shun the public. On her mailbox in Dornach only the initials JvH are to be seen. Photos of her are hard to find. 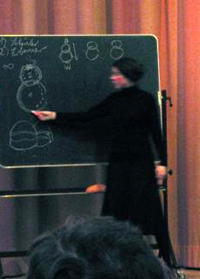 Only the German culture blog “netzhaueter.de” published two secretly photographed images of her giving a lecture in Mannheim in 2009, but they certainly don’t reveal very much. According to the same website, she claimed in this lecture that AIDS is caused by the belief that humans evolved from apes. Dementia is a sign of a misguided Time Spirit. But she doesn’t come across as a dewy-eyed nutcase. We read further in the blog: “Instead of some evanescent being of light, there stood on the stage a fragile graceful person with a warm-hearted charisma and laughing eyes.” Only the bandaged wrists hinted at the miracle. According to other sources, she has a charismatic radiance and feminine charms, which she could make use of quite easily. Even in 2005, the Vorstand of the Anthroposophical Society in Germany had publicly distanced themselves the “beliefs, interpretations and aspirations” concerning the stigmatization of Judith von Halle. The cause of this “undoubtedly existing phenomenon” must be considered unaccounted for, wrote the Vorstand. However, the events could “divide asunder” the Society if attempts are made to elicit the anthroposophical meaning of stigmatization. As a matter of fact, all hell has broken loose among anthroposophists ever since the bleeding wounds were made public. While many revere von Halle as a clairvoyant and an initiate, others revile her as a black magic occultist and con artist who belongs in a carnival side show. When the stigmata first appeared, von Halle had been working as a part-time secretary at the Anthroposophical Work Center in Berlin. The case ignited “fierce arguments” that “gross managerial misconduct” had taken place, as the Vorstand (Board) of the Anthroposophical Society in Germany had determined. For example, unauthorized mailings were sent out, office locks were replaced and computer passwords were changed. Office manager Peter Tradowsky had also attempted to separate the work of the Berlin Center from the Anthroposophical Society. At age 78, the veteran teacher and author Tradowsky had promoted his young co-worker with the miraculous stigmata from the start and he also reconciled his interpretation of the phenomenon with the teachings of Steiner. Accordingly then, the stigmatized body has to be the “phantom body which will carry human beings beyond present earth evolution into the Jupiter-existence.” Without further ado, the Vorstand of the German Society fired every last employee at the Berlin Center. Without skipping a beat, Tradowsky, von Halle and her faithful followers launched a counter organization: the “Free Association for Anthroposophy.” It seeks to be understood as a “group maintaining objectivity within the General Anthroposophical Society.” Later on, the organization founded a branch in Dornach at the carpenter’s workshop. Under the same roof, the Verlag für Anthroposophie [Publishing House of Anthroposophy] was established. It publishes exclusively books by Judith von Halle and her followers, although the name suggests otherwise. The Verlag für Anthroposophie is led by Joseph Morel, who for many years had directed the Verlag am Goetheanum. There he also published the first books of Judith von Halle, something that caused great resentment at the Goetheanum. By mid-2009, he was replaced in that position. In the last few years, the focus of von Halle’s activities has increasingly shifted to Dornach, the global center of anthroposophy. Meanwhile in Germany, at the instigation of Tradowsky, a “Judgment-Finding Commission” (JFC) [UFK in German] was established with prominent anthroposophists on board. After two years of investigation and tough negotiations over allegedly falsified statements, the Commission produced a 107-page final report in mid 2008. Not only did they recommend the rehabilitation of Tradowsky --- who had rendered outstanding service to the Anthroposophical Society “with extraordinary commitment” --- but also campaigned for the promotion of von Halle. It is stated in the document made available to Sparrow News that her stigmatization, her abstinence from food, and her “outstanding” research skills in Spiritual Science should be publicly acknowledged as facts within the scope of the Anthroposophical Society in Germany. The JFC further suggested that von Halle be given the opportunity to hold a research colloquium on these phenomena and to establish a “Christological or Theological Section within the framework of the School of Spiritual Science” in Dornach. The Commission justified its recommendations because von Halle has researched these phenomena spiritually since 2004, and, with the help of anthroposophical spiritual science, has made them comprehensible. Her books have found a wide anthroposophical readership and have become bestsellers. The backbiting among anthroposophists continues unabated even today. The Vorstand of the General Anthroposophical Society in Dornach has been keeping a low profile so far. It is glaringly obvious that, despite internal differences within the nomenclature, von Halle finds absolutely no support. In 2009, Sergei Prokofiev was the only Vorstand member who dared come out and criticize von Halle’s statements. In the anthroposophical magazine, “Das Goetheanum,” he objected to the “stupendous pretense” that the stigmatized one extols. On the other hand, von Halle has also been supported for a long time by prominent anthroposophists and especially by wealthy donors in anthroposophically inspired companies in Germany --- if you can believe insiders. In fact, Wolfgang Gutberlet (Tegut), Götz Rehn (Alnatura) and Goetz Werner (DM) established together a German foundation that donated half a million euros to the Free Association of Anthroposophy. Some voices are therefore warning of a real “acid-test” and a huge shifting of the balance of power within the anthroposophical movement. There is even a fear that the Society could be shattered to pieces over it. In order to bring the different viewpoints into conversation, a public exchange was scheduled in Essen. Unfortunately, von Halle rejects all requests for interviews by media people. Also she was not available for the Sparrow News. She wants to guard her privacy and can only work in peace and quiet, says publishing director Joseph Morel. Up to now, stigmatizations occurred almost exclusively in strict Catholic environments. Moreover, the Roman Catholic Church always confronted the phenomenon with skepticism. Indeed the church has canonized 13 stigmatized saints and beatified a few others. But it does not evaluate the wounds as miracles nor as evidence of saintliness. In previous canonizations and beatifications the wounds are either completely ignored or else mentioned only in passing. The majority of medical doctors as well as theologians today proceed from an assumption that the cause is primarily natural and psychosomatic. “The victims do not take themselves to be Christ, but rather they want to empathize and suffer vicariously with the crucified one,” explains Gerd Overbeck, a psychiatry professor in Frankfurt, who has investigated many cases. The two most famous stigmatics in the 20th Century are the now canonized Padre Pio and the Bavarian peasant Therese Neumann. Among anthroposophists the phenomenon is not entirely new: Richard Pollack, who had worked a hundred years ago during the construction of the first Goetheanum, likewise reported about his stigmata. Steiner should have recommended exercises for him so he could he could have gotten rid of the wounds. This article was originally published on December 13, 2012 in the Swiss Spatz Zeitung Online that covers Basel, Arlesheim and Dornach. SouthernCrossReview.org does not guarantee the accuracy of its contents, nor of those of the Der Spiegel article cited above.